Hsinchu, Taiwan – 26 March 2015. 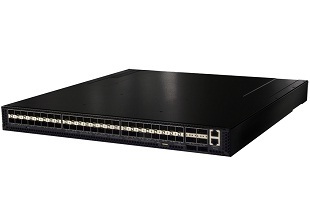 Edge-Core Networks Corporation (www.edge-core.com), a professional networking solution provider offering a complete range of enterprise-level and service provider/carrier Ethernet networking equipment and services to customers and partners around the world, released a 10GbE Top-of Rack Switch, AS5712-54X, which is a cost-optimized hardware design for volume rack deployments, with forty-eight 10GbE SFP+ and six 40GbE QSFP ports in a 1U form factor. The switch is based on Broadcom’s StrataXGS○R Trident II Ethernet Switch silicon, and has a CPU daughter module with an Intel Rangeley C2538 processor. Edge-Core AS5712-54X is the first network design approved by Open Compute Project (OCP), which provide the solutions with lower equipment cost thorough choice of standard switch hardware and increase the flexibility for choosing broads set of open source Network Operating System (NOS) software. • 48 x SFP+ switch ports, supporting 10GbE (DAC, 10GBASE-SR/LR) or 1GbE (1000BASE-T/SX/LX). • Switch Silicon: Broadcom BCM56854 Trident II 720 Gbps. • CPU: Intel Rangeley C2538.